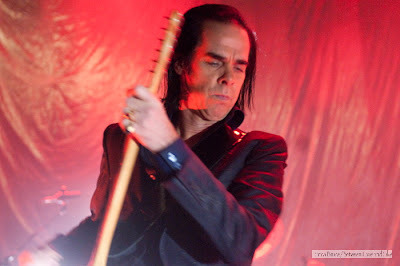 I covered Mr. Nick Cave and his side project Grinderman, who played at the 930 Club for the WCP a few days back. My friend, also named Nick, writer and editor for Bloodbeat.com summed up Cave and Grinderman in a brilliant sentence. He said Grinderman was "More about destroying the structure of songs as well as shouting about getting well-laid and breaking hymens world-over with a flexed mustache muscle and laser eyes." Testify, ladies and gentleman, testify (See all of the photos of the show here). I wasn't an immediate convert to Cave. He was good live, yes, but, I can't explain it, something was still missing for me. If I'm on the edge about band, it's usually their live show that can tip the scales for me, but I was still fence-sitting about Cave, even after Tuesday's show. I liked the intensity and the passion he displayed, but... I was yet to be convinced (in fact, I left before the encore). But then I happened upon the video for "Dig, Lazarus, Dig!" from the 2008 record Dig, Lazarus, Dig!!!" the next day, and... I finally got it, that weird, inane attraction that so many have for Cave. And I'm not even a fan of vampires! Just Let the Music Take Us and Carry Us Home: Bruce Springsteen's Appearance on "Late Night with Jimmy Fallon"
I raced home from shooting Nick Cave at the 930 Club last night to be sure I caught all of Bruce Springsteen on "Late Night with Jimmy Fallon." Springsteen was to be the only guest/performer on the show and given what a fan Fallon is, and that the new box set The Promise: The Darkness On The Edge Of Town Story, came out yesterday, it was bound to be an incredibly wonderful reason to stay up late. Indeed it was. We heard good stories about the making of Darkness, like that Springsteen's guitarist, Steve Van Zandt, wanted to call it "A Bunch of Lost Arguments," and that Springsteen wrote the song "Fire" for Elvis Presley. There was also a spot-on recreation of Bruce's look from back in the mid-70s...back when the E Street Band was a band who wore hats. "Now there's something coming through the air, that softly reminds me..." sang Springsteen. Late night tv can sometimes feel canned but this wasn't one of those times. This was a soft reminder of how great a performer Springsteen is, as well how well the man has long been able to turn a phrase. Watch the whole episode...it's definitely worth it. Arcade Fire brought their 45 members dressed as brightly as their infectious melodies to Saturday Night Live this weekend. Playing "We Used to Wait" and "Sprawl II" from the new record, The Suburbs, I was never a big AF fan, but after humming "Sprawl" all of Sunday, I think it's safe to say they've found their way into my brain matter. Win Butler is the thinking man's frontman, and I loved that he's so into connecting with the audience; Had he been able, I think he may have climbed through the camera and into our living rooms to sing to us personally. But who dresses Regine I wonder, the Olympic Committe for Ice Dancing? It's Wednesday and I'm struggling with a project for the day job, so I started digging around on eMusic with the idea of listening to something raw and guitar-laden in mind. Something that could shake me out, something that rawwwked, but something that still had melody. 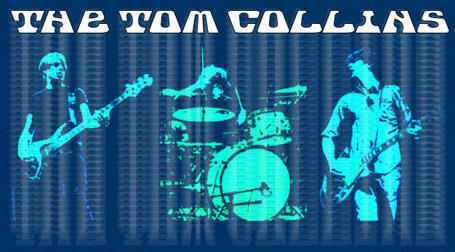 Somehow, I wound my way back to the great gritty-but-melodic song, "Back of Your Mind," by a 3-piece out of Athens, GA called The Tom Collins. TTC is no longer together, but you may know most of the members. Bassist Craig McQuiston has long been the tour manager extraordinaire for The Hold Steady. Vocalist Fran Capitanelli now plays with Butch Walker. Drummer Kyle Spence played with Harvey Milk. Collectively, the band made three records full of thick licks and catchy melodies before calling it quits, but if you're lucky, they do one-off shows together once in a blue moon. "Back of your Mind," from the trio's last record, Daylight Tonight is the one I find I go back to often. It's a perfect song for blowing out the speakers from turning it up to 11 for sure. Read our 'Men Without Ties' interview with McQuiston here, where he talks about tour managing and musician life. 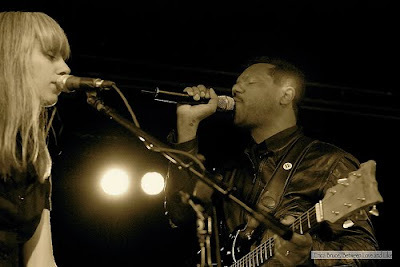 The Dears announced today their next release will be called Degeneration Street. Word has it that DS is along the same form as previous records like No Cities Left and Gang of Losers, full of yummy Brit-pop. 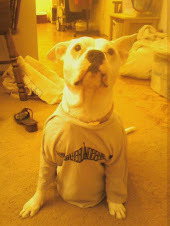 One of the first singles to be released is "Omega Dog." The video below is from a recent show in Mexico City. Degeneration Street is out 2/15 on Dangerbird Records. The Henry Clay People Rock Nic Harcourt and Livebuzz.com with "Slow Burn"
Five of our most favorite guys are in the band, The Henry Clay People and they met up with Nic Harcourt as they were touring about the countryside this summer rocking butts and winning hearts. If you don't know them already, give a listen to the rawk-tastic "Slow Burn" from Somewhere On the Golden Coast. Then you can tell your friends you knew them before they got arena-huge.